Most adults know how important hope is in people's lives. At Children's Worship Bulletins, our bulletins let you demonstrate to your students how hope can make a difference. With our Bible-based bulletins, you can easily create Sunday school activities about hope to bring the subject alive and show its true power. All of our Sunday school bulletins about hope have been reviewed by our educational specialist which allows us to provide you with age appropriate activities which can be used individually or transformed into group activities. We have two age levels available, ages 3-6 and ages 7-12, so all of your students will be able to join in the fun and learn about the Bible at the same time. Here is one example of our Children's Worship Bulletins about the power of hope. It can be transformed into a group activity as shown. Print out the bulletin and the answer key for the featured activity. Have your students group into pairs. Explain, "Each group should complete the subtraction problems then put the corresponding letters in the blanks." Set a time limit of 5 minutes. Award the first pair finished with a small prize. Reinforce that hope makes a difference in our lives. Children learn best when they are engaged and having fun. With our activities, such as puzzles, word pictures, codes and mazes, your students will learn about the Bible and have fun at the same time. Our activities are based on the Old Testament, the four Gospels and the Epistles. Our library provides you with an easy search function that allows you to find a bulletin based on a specific Scripture. You can download as many bulletins as you may need. Our bulletins come in black and white or color. We want to ensure that you are completely satisfied with our bulletins, and that is why we offer a full refund if you are not 100% satisfied. 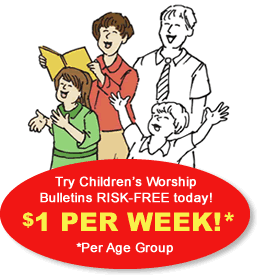 We provide only the best bulletins with the most relevant and Bible-based material.